On Thursday evening, Stations 227, 222, 223, 225, 196 were alerted for a residential structure fire as a result of a domestic dispute. 227 Chief arrived on scene with moderate smoke showing from the front door. 227EN arrived moments later and crews pulled attack lines. 222EN arrived on scene and secured a water connection to 227EN. 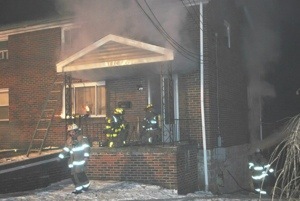 223EN took a second attack line to the rear of the house where they located the bulk of the fire in the basement. 225 checked for extension and hot spots. 196RIT staged in the front driveway. All units worked swiftly to contain the fire. ACFM is investigating the cause of the fire.